A fellow Bredesen Center student, Beth Papanek and I co-founded Nano Elements Source, LLC in 2015 with TopFive, Inc out of Chattanooga, Tennessee. We are a biotech startup using bacteria to produce abundant, natural nanoparticles. The high price of nanoparticles is hindering their adoption in markets such as energy-efficient, large-area displays, roll-to-roll printable solar panels, and printable electronics. Our radically different approach avoids the high energy demands and corrosive chemicals of traditional processes by using bacteria to grow nanoparticles. 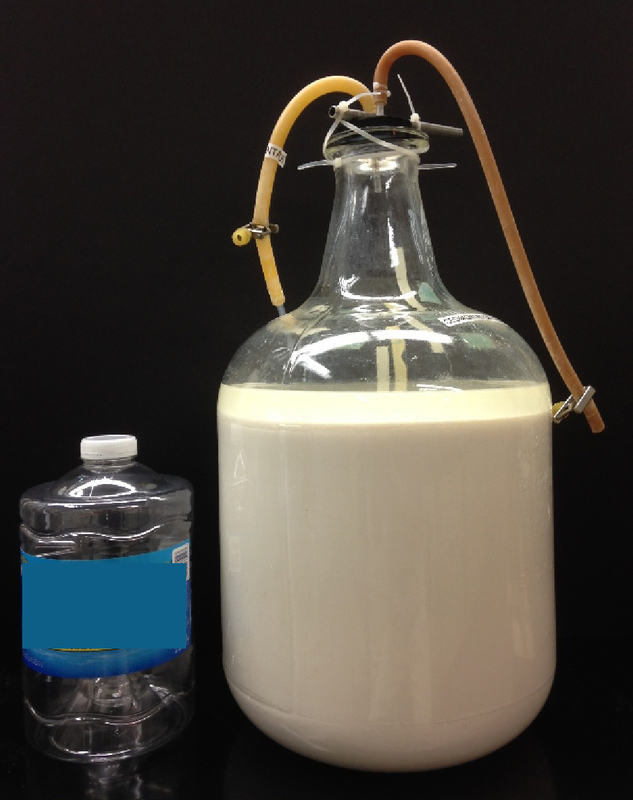 20L of fermentation mixture ready for nanoparticle separation. Photo courtesy of Oak Ridge National Laboratory. Nano Elements Source, LLC uses bacteria to ferment high-quality, cadmium-free, quantum dot (QD) cores at greatly reduced production costs of traditional synthesis methods. Similar to the process of fermenting alcohol, sugar is fed to single-celled organisms. As these cells grow, they produce the QD cores extracellularly. We have licensed exclusive rights to this proprietary intellectual property. The abundant, photoluminescent QD cores produced by this technology have a narrow size distribution that improves the optoelectronic properties, and makes the particles valuable for wide-ranging industrial applications including energy-efficient, large-area displays and printable electronics. Though QDs have an enormous market potential, implementing them broadly is currently insurmountable due to the extremely high cost of manufacturing. Our technology reduces the cost to a point where market expansion is feasible. In addition to producing higher quality QD cores, we can replace the current methods of producing nanoparticles. Nanofermentation reduces the required energy consumption by operating at 70℃ with no additional mechanical inputs. By comparison, current technologies for nanoparticle production include harmful chemicals, temperatures from 400-600℃ and mechanical grinding to reduce the size of the particles. These methods make the energy requirements, and thus cost, for producing the particles extremely high. The reduction in heat and processing through fermentation greatly improves the energy efficiency of producing QD cores. An image showing the comparison between the amount of nanoparticles (small dots) and biomass (three bacteria). Photo courtesy of Oak Ridge National Laboratory. The history of NanoFermentation begins in extreme environments. In 1999, the discovers of Nanofermentation isolated extremophile bacteria from a two mile deep gold mine in Africa. Other Nanofermentation species were found in oil and gas deposits in 1992. The NanoFermentaion process won the research team a 2006 R&D 100 award and a 2006 Micro/Nano 25 award. Nanofermentation research continues at ORNL as scientists engineer bioreactor conditions to create more varied nanoparticles. Nano Elements Source has executed an exclusive full license for the rights to produce nanoparticles with nanofermentation. This critical step will allow us to begin production and revolutionize the quantum dot market. The personal website of Patrick Caveney.